Next Jam is March 26, 4:30-6:00! 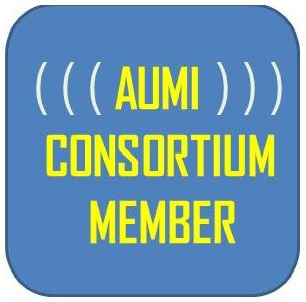 Now in its fourth year, the AUMI Jam and Recording Sessions are a series of monthly community improvisations sponsored by AUMI-KU InterArts, Independence Inc., and the Sound+Vision Studio of the Lawrence Public Library. 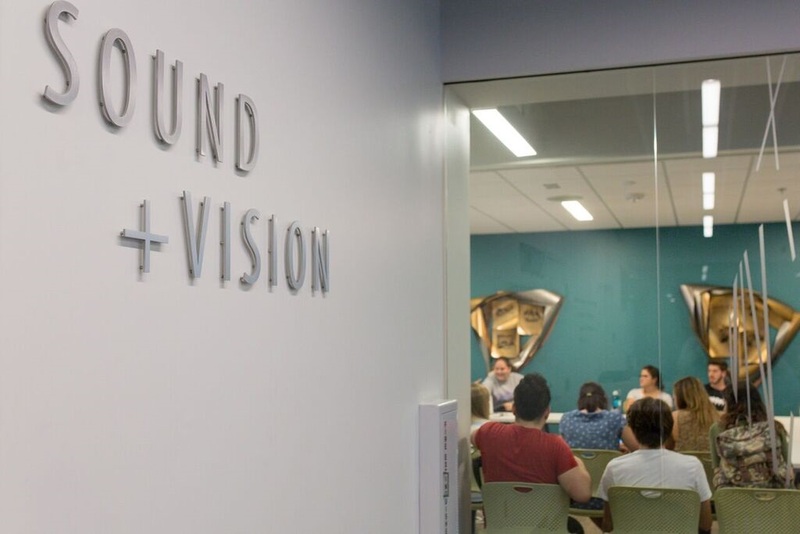 Sessions are free, and take place in the Sound+Vision Studio and nearby meeting room, and are open to anyone who wishes to participate. 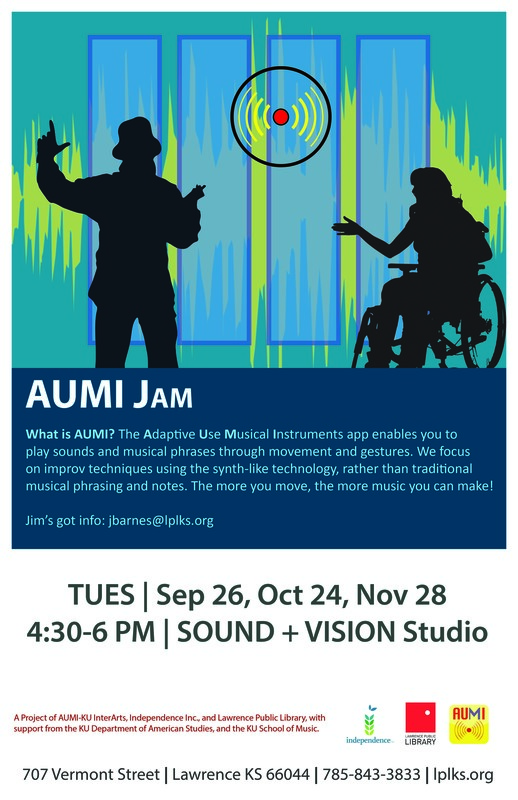 The these all-ability jam sessions will begin again on January 29, 2019, and will continue each month. What happens in an AUMI Jam Session? Each session typically begins with an introduction to the Adaptive Use Musical Instrument in the meeting room. 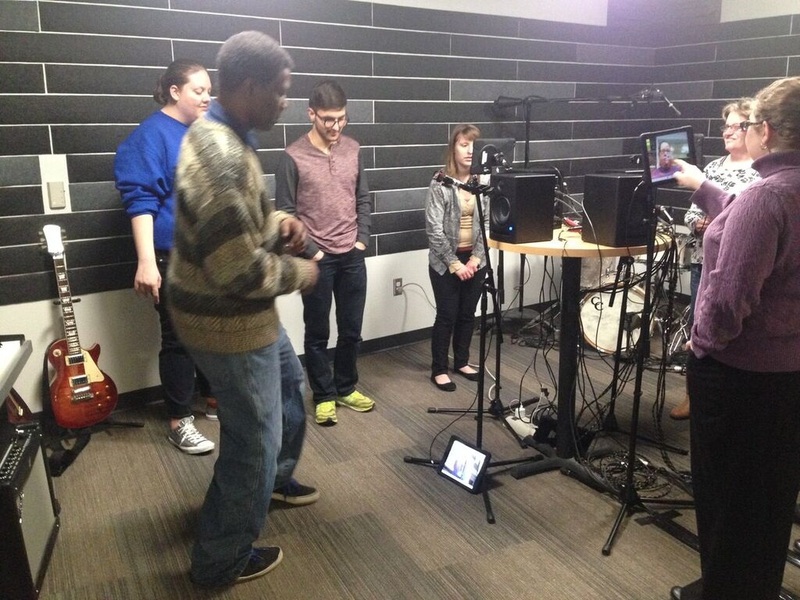 Students from the KU Music Therapy Department provide tips and assistance for how to set up the AUMI on laptops and iPads for each participant to try out ways of playing it. 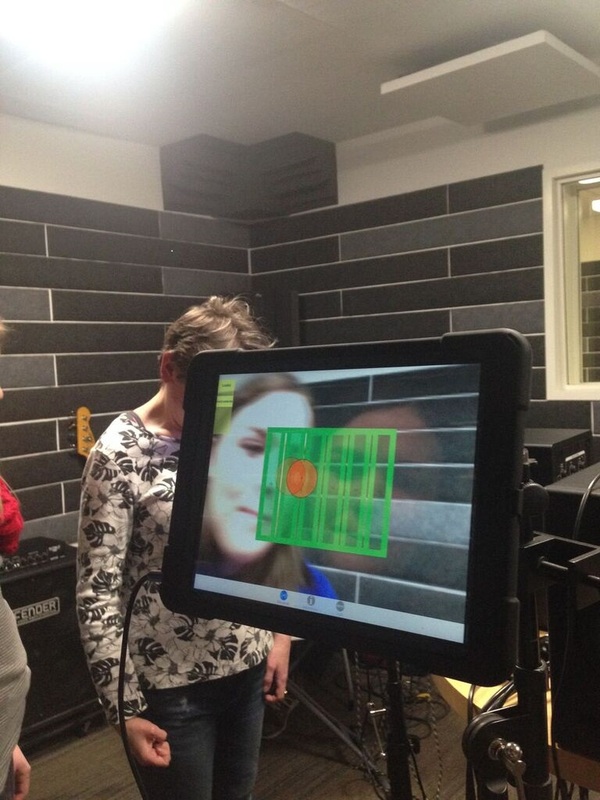 Since the instrument works by using an outward-facing camera in the laptop or iPad to trigger sound through movement, the chance to try a few approaches and to decide whether to play timpani with a tilt of the chin, or piano with a side-to-side sway, or flute with a dancing foot before going into the studio is a welcome opportunity for many participants. 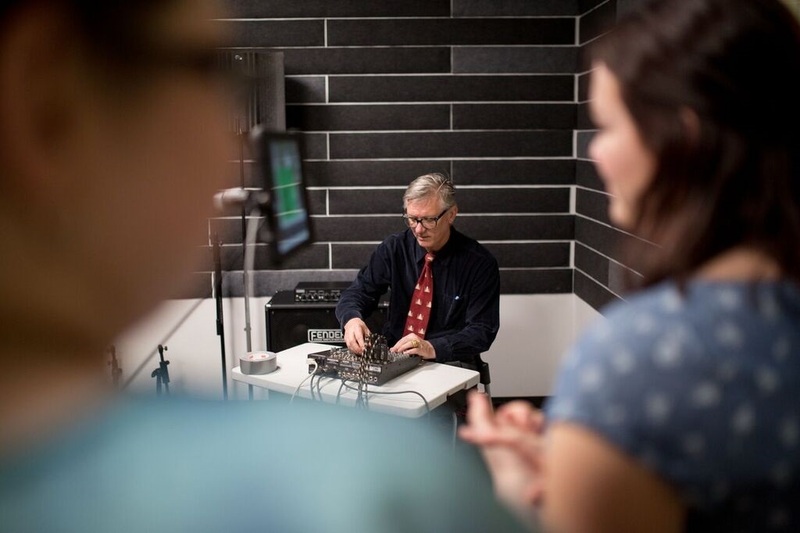 Then, in groups of 3 or 4, those who wanted to participate in recorded jam sessions enter the gorgeous Sound+Vision Studio where the studio manager records their improvisation and loads it into the Sound Cloud. What Happens in the Recording Studio? 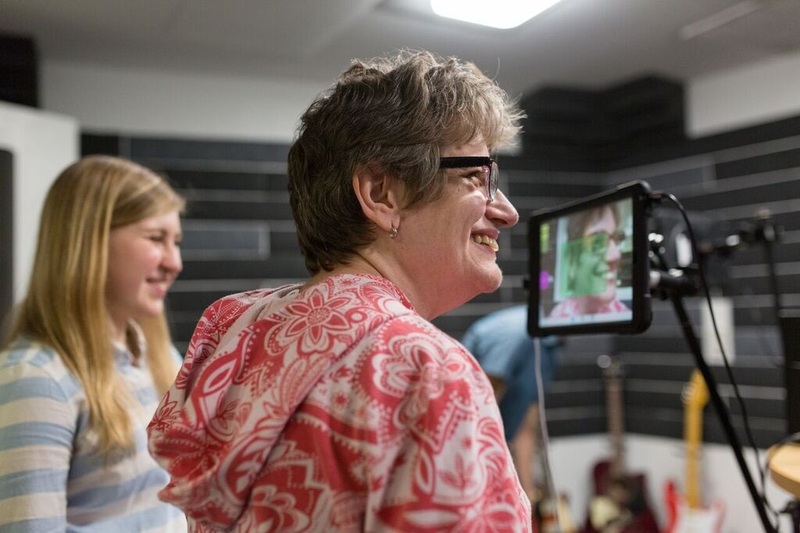 On entering the Sound+Vision Studio, one finds four iPads mounted on flexible stands that can be adjusted to track any body movement a participant wishes to use. The space easily accommodates wheel-chair users, and the flexible stands can be raised high enough to track the nodding head of a tall standing person, or low enough to track the foot of an AUMI user who has chosen to have the camera track their dancing foot. 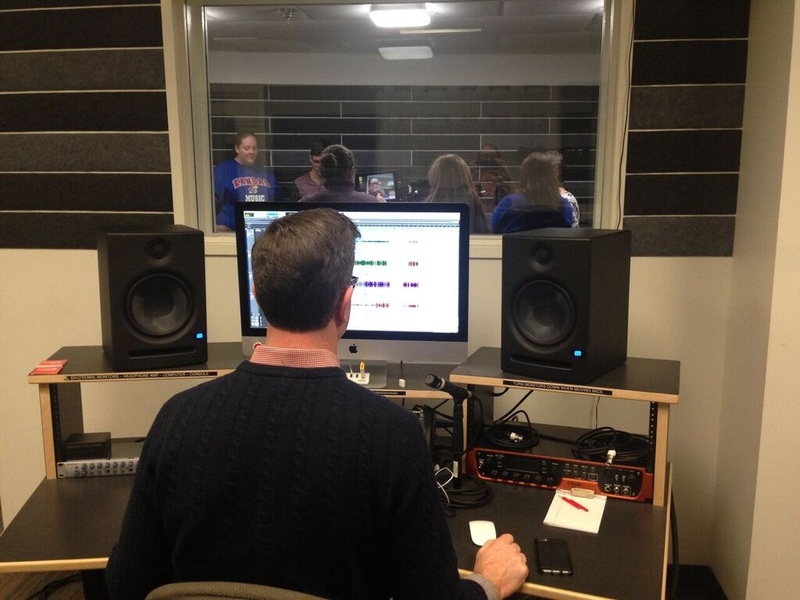 KU Music Professor, Kip Haaheim, mixes the levels in the studio, and Sound+Vision Manager Jim Barnes (former manager Ed Rose pictured here) captures the recording from the booth, cleans it up a bit, adds the name of the piece that the musicians have decided on, and uploads it into the SoundCloud.